More formally, Yusif Al Bin Khalil, a writer in the hard-line Al-Watan newspaper associated with the royal court, has produced since May 18 three different variations on the same theme: namely, that the U.S., and the U.S. Embassy in Bahrain in particular, is aligned with the country's opposition. The series is subtly titled "Washington and the Sunna of Bahrain." April 21: "When Will America Understand Who is the Strongest in Bahrain Now?" April 22: "When Bahrain is Presented as a Gift [to Iran]"
April 23: "Washington's Friends in Manama"
April 24: "Washington and the Sunna of Bahrain: Beginnings of Introduction"
April 25: "Washington and the Sunna of Bahrain: The Start of the Conflict"
April 26: "Washington and the Sunna of Bahrain: Open Attack"
April 27: "Washington and the Sunna of Bahrain: The Curse of Bush"
May 3: "Washington and the Sunna of Bahrain: The Fool of NATO"
May 4: "Washington and the Sunna of Bahrain: The Occupation Scenario"
May 5: "Washington and the Sunna of Bahrain: Funding the Opposition"
May 8: "Washington and the Sunna of Bahrain: Sunni and Shi'i Terrorism"
May 9: "Washington and the Sunna of Bahrain: Who Fooled the Americans?" May 10: "Washington and the Sunna of Bahrain: Who Has the Legitimacy to Rule?" This looks like it comes from somewhere else, but it's made its way around the forums nonetheless. 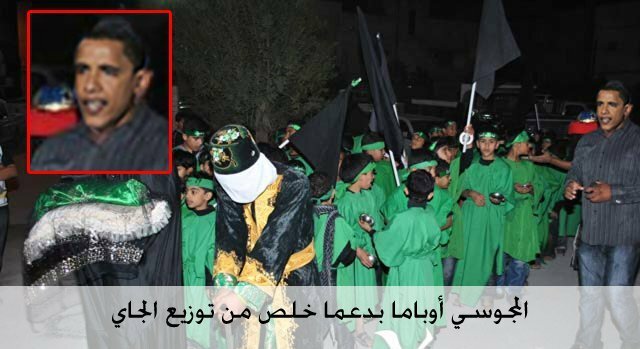 Then, we have this tongue-in-cheek gem showing Obama taking part in a Shi'a passion play procession during Muharram. 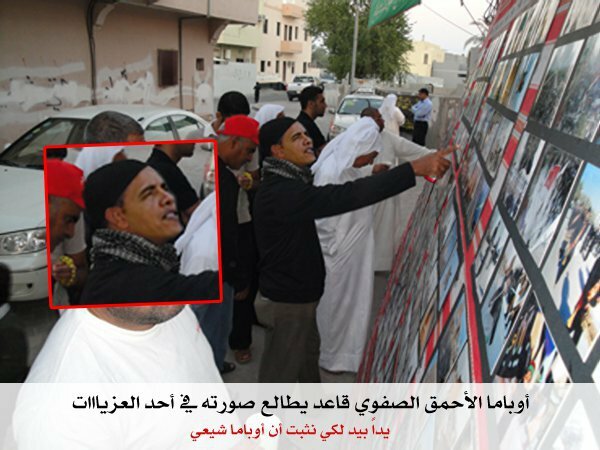 The caption is: "Majusi [slur for "Shi'i"] Obama spotted last year during Muharram roaming around after he finished serving tea [to celebrants]." but I have a problem with you interfering for the [sake of the] Gulf Shi‘a. wield the stick with justice [? ], and grasp it from the middle? in favor of the Persian ‘Ajam? If you’re black, [unclear?]. Mr. Obama, Bush is out [?] but like you I ask [?]. and married its sister [i.e., Iran], and you go on [like nothing happened]. 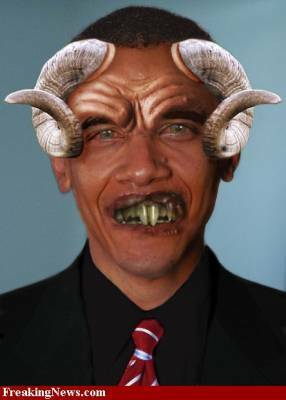 Mr. Obama, you have to know the Arab Gulf culture and customs. Why don’t you understand the real problem of the Gulf? in war? Or is it something else? Mr. Obama, you don’t turn, turn in empty circles. More Updates: It seems everyone is now getting in the mix. Despite the National Unity Gathering's group-wide letter to Obama, both al-Asalah and al-Manbar al-Islami have posted their own individual replies to his remarks on Bahrain. And the Coalition for a Republic has done the same. Citizen: "I don't hear you; I hear what my national conscience tells me, and it's that stability and security are what's important to Bahrain." I can't believe they are serious! 1-someone actually posted that , since Obama's middle name is "Hussain" and mother's name is "sakeena" , then he has to be "Shitte" !! Mr. Gengler, what is the point you are trying to make in this rather lame posting? @Anon above me: Because they're humorous yet accurate analysis of the situation in Bahrain? "Lame posting"? What would you like? A review of your favorite band? hahah i hope they are not serious .. it's a disaster if they are thinking this way .. OMG ! I still don't understand what interest the USA would possibly have in seeing a Wilayat Faqih in Bahrain where their 5th fleet is based. Surely if there was an Islamic state loyal to Iran the base would be the first thing to go, these articles seem to be suggesting that the USA wants the overthrow of the regime precisely to pave the way for an Iran style theocracy. Can anyone enlighten me as to what the actual argument is? I've read through most of the articles but must be missing something pretty fundamental as it just doesn't seem to make any sense to me at all. It seems more like sour grapes over the muted criticism than anything real. Justin maybe you could provide us some insight of what is to come. -Protestors are going to protest "hard" on june 1 but still peacefully. -Cops are gonna crush them quickly not even allowing them leave the village let alone their homes. Opposition members are saying its time to move away from peaceful protesting because the riot police wont let you protest peacefully. Time to use some "force". What do you think should be the next move if the opposition want any chance in returning to the streets? I was just doing a search for Michael Moore and found this here blog post of yours. Catchy. I'm happy to read that you are safe and home in the U.S. I noticed I had a reader overseas for a while, and before I freaked out too much I Googled you. I hope you are doing well. I read on your sister's FB that she is going to be an aunt, and I am left wondering if you are going to be a daddy?!? !